In the mixed-age kindergarten (ages three to six), the teachers gently lead the child across the bridge from home to school, laying a strong, healthy foundation for later academics. At this age, children respond to their environment and learn by imitation, so kindergarten teachers model reverence for beauty and goodness. THE PARENT-CHILD PROGRAM is a weekly playgroup designed to provide an active, loving, sensory environment for young children from birth to age three, as well as a support group for parents. 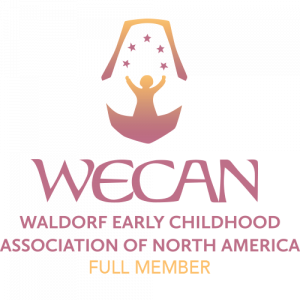 It is also an opportunity to learn about Waldorf education. For more information about the Parent-Child Program, click here. The current brochure for the program can be downloaded here. THE KINDERGARTEN teachers provide a homelike environment, where children sing, paint, and learn by watching puppet shows and hearing stories, developing their bodies, imaginations, and skills in a safe setting. The rhythm of the day includes making and eating meals together, and free play with simple, natural playthings, like shells, seeds, handmade dolls, wooden toys, beeswax crayons, and modeling wax. Kindergartners always enjoy an abundance of fresh air and spend a good portion of every day outdoors. Because children live so deeply in the environment around them and imitate all they see, the teacher strives to create an environment that is worthy of emulation. The kindergarten days are organized to reflect the healthy rhythms in the day, the week, and the year. For the 2016-17 school year, we’re expanding to a five-day kindergarten.